The M.S. in Engineering with an Emphasis in Civil Engineering degree provides specialized expertise in civil engineering by providing a rigorous curriculum and innovative research in two distinctive areas: Structural and Geotechnical Engineering and Environment and Water. Specifically, the program offers students the opportunity to conduct state-of-the-art research in asphalt and concrete pavements, pavement evaluation and preservation, bridge engineering, non-destructive testing and evaluation, structural and materials modeling, transportation geotechnics and geomechanics, hydrology and hydraulics, urban water, environmental processes, sustainable coastal and river engineering, environmental fluid mechanics, water resources planning and management, and interdependence of infrastructure systems. 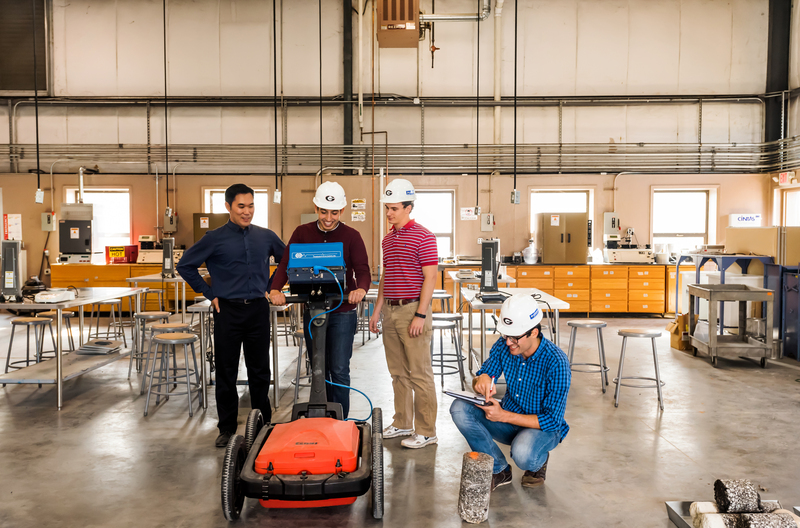 The STRuctural ENGineering Testing Hub (STRENGTH) Laboratory and the GMAT Laboratory are two key research facilities where students and faculty work together to advance these areas. Students may tailor a plan of coursework to their interests by drawing from extensive course offerings spanning several engineering disciplines as well as other schools and colleges at UGA. 9 hours of which must be selected from the Civil Engineering Emphasis course list. As a requirement of the M.S. Engineering Degree with Emphasis in Civil Engineering, students must complete a minimum of 9 credit hours selected from the list below. Students will work with their graduate advisor to select the most appropriate specialty area and coursework to ensure breadth of understanding as well as mastery of knowledge in a specific subject area. Emphasis courses will be reviewed each academic year and updated as needed to reflect new areas in the field. In addition to completing 9 credit hours selected from the list below, students may work with their graduate advisor to develop an interdisciplinary plan of coursework drawing from the extensive graduate course offerings available at UGA. M.S. requirements. No additional requirements.